Kimito is a 15-year-old, first-year high school student when he is abducted and taken to Seikain Jogakkou, a secluded and highly secretive school for "Ojou-samas," or young women from wealthy and influential families. He is deemed a perfect fit for a new program at the school meant to help make the students' transition to society less traumatizing, by introducing a male "commoner" to the student population. One of the most important factors for choosing him was that he is only attracted to muscular men, misinformation provided by his mean-spirited childhood friend, Eri. Kimito is an average student, who enjoys cooking and taking care of others, and he is given his nickname "Sebastian" during Middle School due to the latter. He begins helping Aika with her plans to become popular soon after meeting her by creating the "Commoner Club." He dubs Aika a "Tsun-pure" not long after meeting her, and greatly enjoys teasing her. This often involves convincing Aika to believe ridiculous notions about commoner-related things, and these instances usually end with her becoming greatly embarrassed and pummeling him. 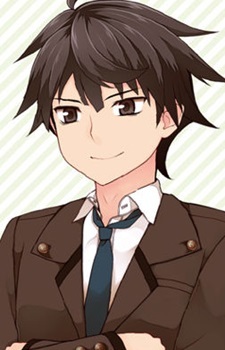 Kimito has a strong thigh fetish, and, although he appreciates Hakua's thighs at one point, he states that he is not a lolicon.